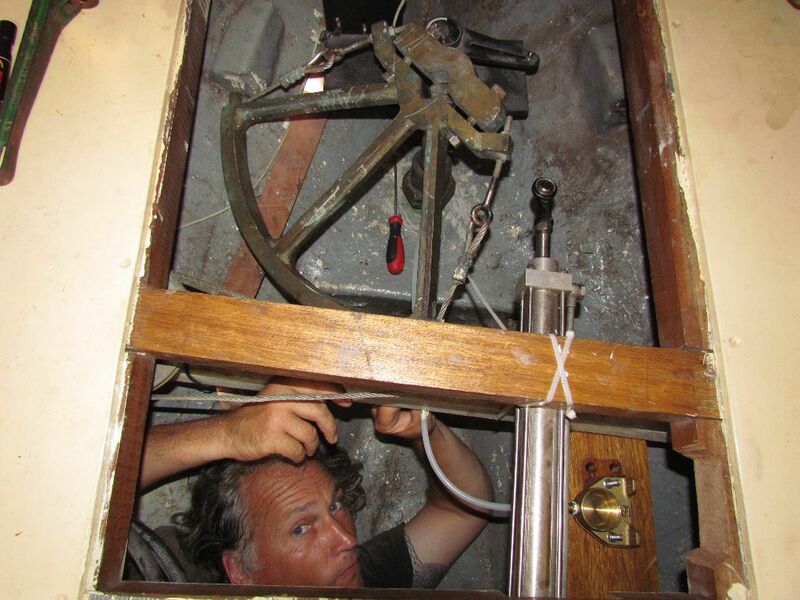 20th July: A very relieved Emerald crew are now floating again and so far so good: the bilge is dry! We’ve bravely left the safety cocoon of Murter to venture a few miles north for a few easy days. 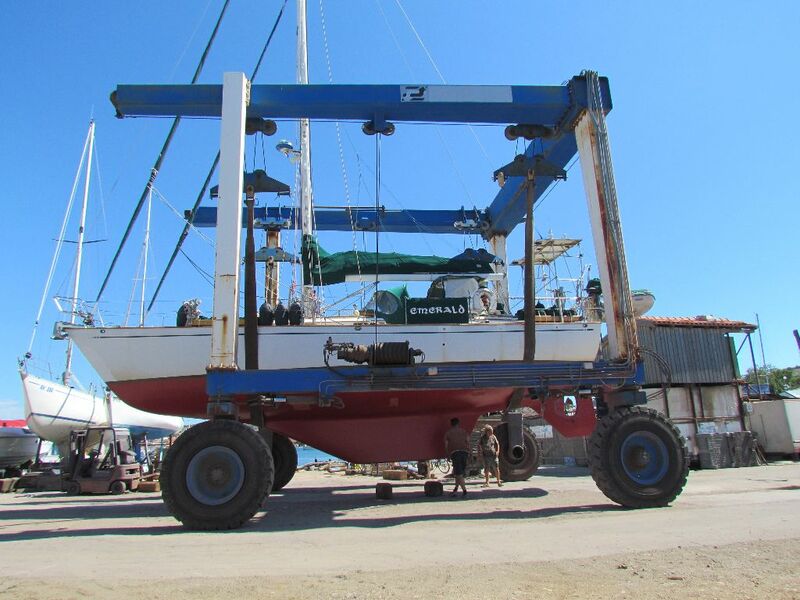 Life in a boatyard can be hard work – physically from all the sanding, painting, climbing up and down ladders and staging and lifting around of heavy things. Working in the 30+ degree centigrade heat didn’t help much either. The stress of knowing whether we’d fixed the leaks or not and the noise of the boatyard (sometimes they started at 6am) meant we’d not had a decent night’s sleep in weeks. Being back floating last night, we slept like logs. 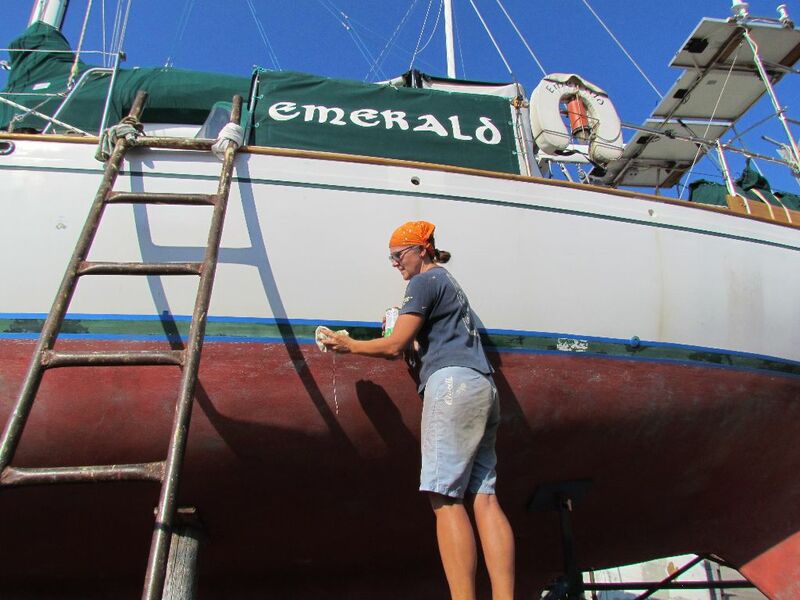 Emerald now has a newly painted, green boot top stripe and between 3 and 4 coats of fresh antifoul on her hull; a mixture of Jotun Seaqueen left over from the last time we painted and Hempel Mille NCT, which was available locally. The Hempel went on much easier and had a larger coverage rate than the Jotun, whether it was due to the age of the paint, heat or the paint’s composition we’re not sure. Blue paint went on first, followed by 2 coats of red – once we get back down to blue we know it is time to antifoul again. Hopefully we’ll get three years before needing to repaint. Colin worked on leak prevention whilst I was on sanding and antifoul duty. Having finally released the propeller with some taps of a hammer on each blade, he was able to remove it and access the propeller shaft. Our prop shaft is almost 3m long and a substantial weight so it’s a two person job to ease it from the stern tube. Then we got to have a good look at the cutlass bearings which definitely needed replacing. We had one new one with us and with help from our friendly yard neighbour Teddie, sourced another from Dodic, a workshop and chandler near Betina. Next it was the rudder stock. 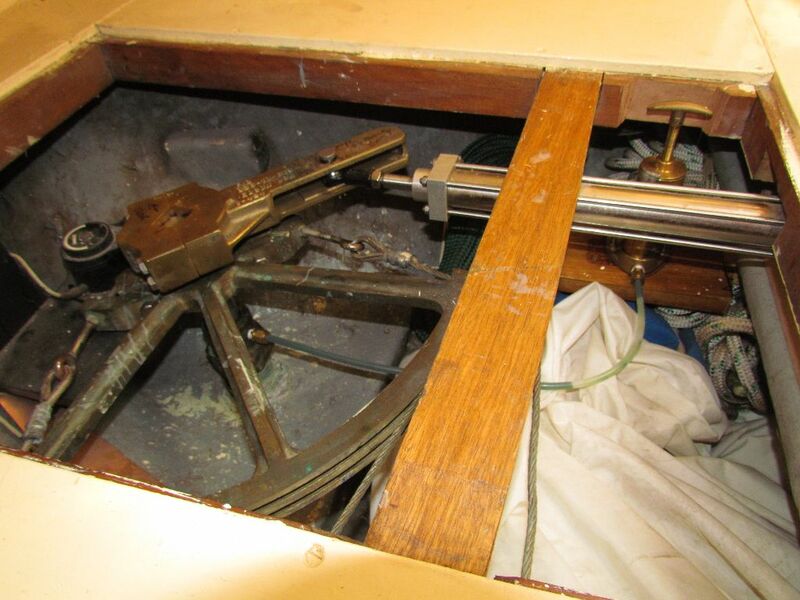 The stock attaches the rudder to the steering cables and comes up into the boat under the bed in the aft cabin. To stop water leaking up around it, it has a metal cap screwed down tight on top which is stuffed with wads of padding and grease. As the rudder turns backwards and forwards, the packing and grease around the rudder stock gets gradually squeezed out, leaving space for seawater to bubble in. Adding new grease to replace that squeezed out whilst in the water is impossible without creating an indoor water fountain. 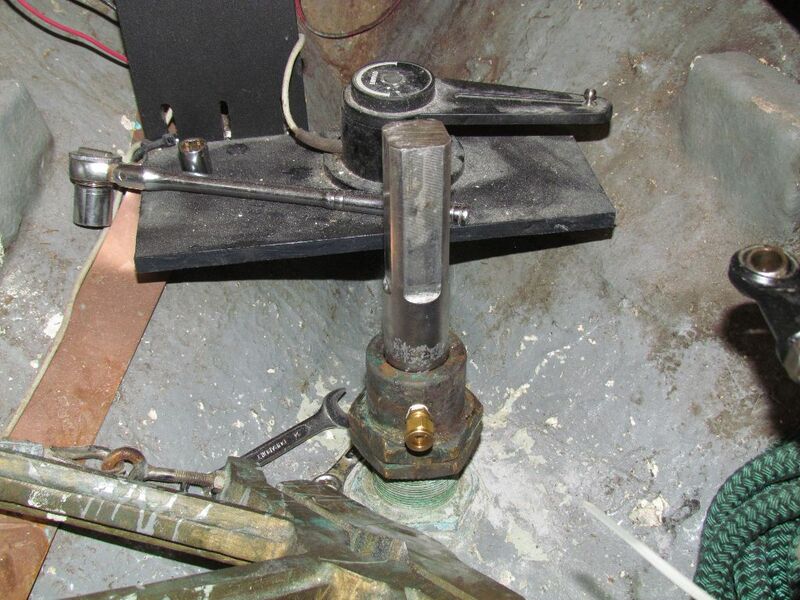 So we installed a remote greaser into the rudder stock cap, this means we can squeeze in new grease to seal up any future leaks without having to lift out of the water. Also, previous wear on the stock had left it with pitting, making it difficult to get a completely leak free seal. Using some metal epoxy, Colin filled in the pitting before sanding it smooth again. We were going to experience our first bora whilst out of the water in the boatyard. 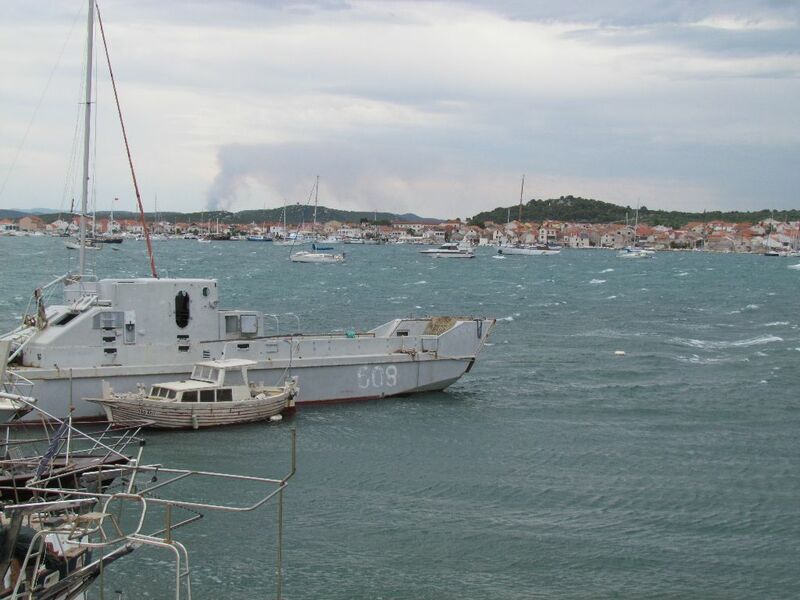 The bora is a very strong north easterly wind that comes to life around the Velebit mountain range, about 60 miles north of Murter. 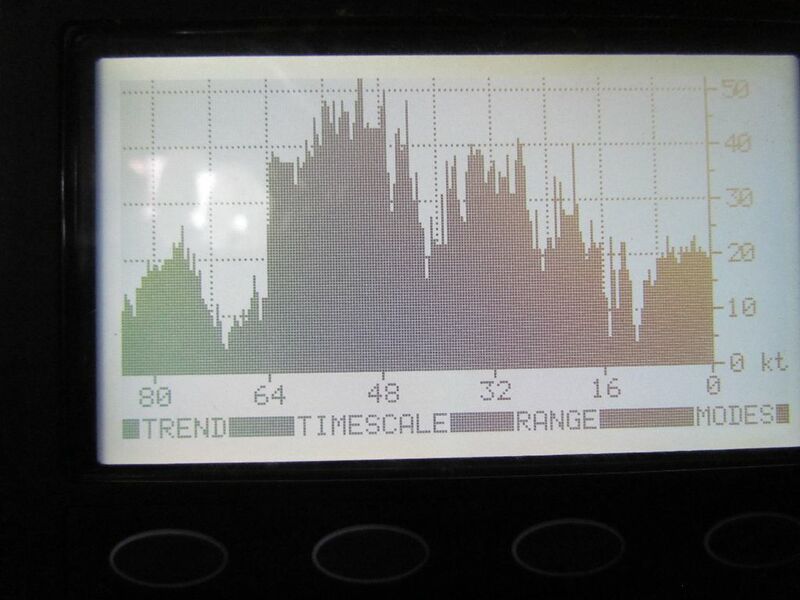 We wouldn’t get the full brunt but the forecast was predicting 40kt sustained winds with much higher gusts. We’d had almost a weeks warning of it’s arrival and had decided not to rush the jobs and get launched before it hit, but to stay out on the hard. The strong southerly wind that sometimes precedes a bora had blown onto Emerald’s bow and we’d barely felt it on board. The bora would hit us on the side, a large target area for the wind to get it’s claws into. My over active imagination created nightmare scenarios of us blowing over like a domino and on the night of it’s approach I laid awake anxiously waiting for the wind to arrive. But as Thursday turned into Friday there was barely a breath of wind and our biggest annoyance was the fleet of mosquitoes that had somehow found their way into the aft cabin and were merrily chomping away on us. That changed at about 1am as a cacophony of howling and rattling started up outside as the wind wrapped itself around the rigging and loose objects in the yard. Most of our portholes were open as the temperature still hovered close to 30c inside making it impossible to escape the noise. The lights outside briefly went dark but were soon back on. A little later we heard snatches of shouting but couldn’t see anything when we looked out. We didn’t get a lot of sleep that night. But it wasn’t due to wobbling or shaking because Emerald barely moved. She had an occasional gentle shudder as a particularly strong squall hit us but otherwise we were rock solid. The yard guys had done a great job of chocking us. Sticking our heads out of the cockpit in the morning let us feel the full brunt of the wind. It really did take your breath away. The anchorage looked awful and as the wind increased through the day we felt extremely glad to be out on the hard during the blow. Anchor chains were bow taut and some of the boats were nodding so much in the waves that their bows were being buried and water was being thrown into the air. I felt seasick just watching. A boat which had been alongside the boatyard wall had gone; we guessed it had been battered too much against the wall. Being on the hard meant we could go for a walk around too; no such hope for those out anchored. If we’d been out in that anchorage I might well have been getting off and never getting back on again. We walked into town to buy more antifoul, jumpers and long trousers making an appearance with the weather more like a grim summer’s day in Britain, especially when a cold rain shower caught us out. On through the night it blew, keeping up the 40 kts. However we slept much better now the worries of Emerald falling over had passed and the cooler temperatures much more pleasant for sleeping. The lie in next morning snuggled and cosy under the duvet was wonderful. By Saturday morning the winds had eased back below 30kt and the anchorage looked much more friendly. Still uncomfortable but the boats weren’t doing their violent pitching anymore. 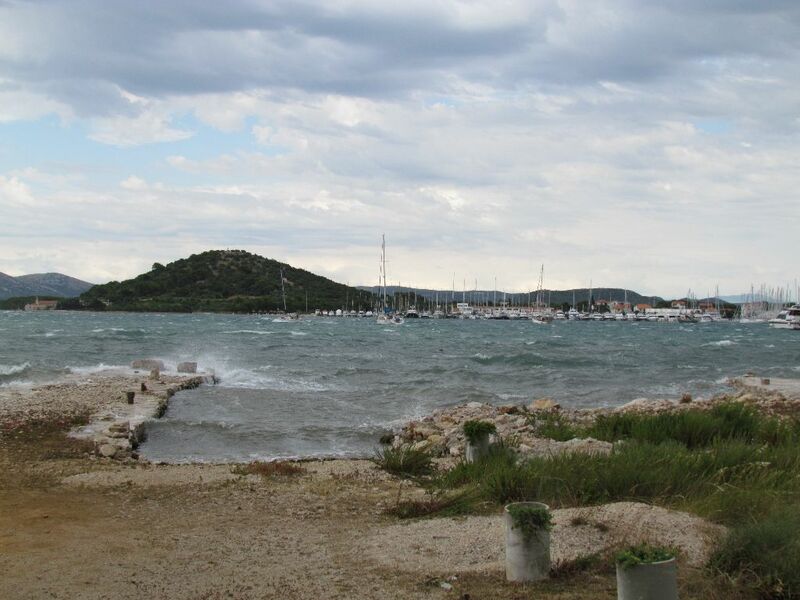 Yesterday’s squalls had blown away but the sky remained grey and it was still a relatively chilly 20c. When your body has been trying to get used to 30c plus, 20c is a bit of a shock. It was still too windy for painting the last coat of antifoul without painting everything else around us (plus being blown off the staging didn’t appeal) so it was another welcome day of rest. By Sunday the wind had eased back to 10 to 15 knots and with still lower temperatures it made for a much more comfortable day to paint the last coat of antifoul on. By mid afternoon we were finished, Emerald’s hull a gleaming signal red, the staging cleared away and the big tidy up begun. 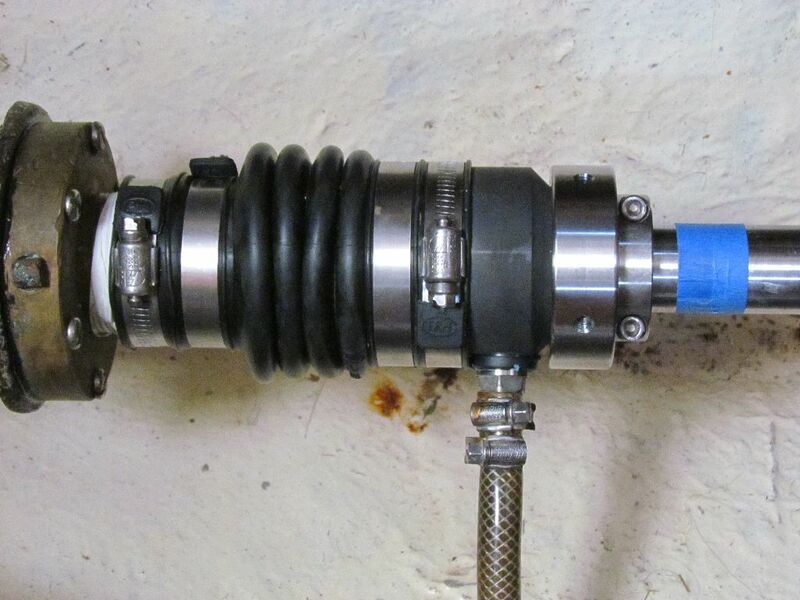 Now For the Moment of Truth – Had we Fixed the Leaks? Monday night we spent in the slings so that the patches under the blocks could be antifouled and at 8am the next morning the travel lift was trundling Emerald over to the slip and gently lowering her into the water. We were left for 10 minutes floating but still supported by the slings whilst we made the leak checks. The rudder stock was dry, even with a few turns on the helm that all seemed good. The prop shaft was dry too, but we would only get to test that fully when under way. The slings were lowered and it was time to leave. We tentatively edged our way out, the yards guys pulling us until we’d cleared the slings. The depth gauge was showing only 10cms of water under the keel – we didn’t want to prang our shiney new paint! Once clear of the lift we gently motored away for a lap around the anchorage whilst making regular checks on Bob, the new PSS shaft seal. Without counting our chickens too soon and all that, we are pleased to report Emerald has a dry bilge and two very relieved and happy crew. We were lifted out and stored ashore at the Vinici Boatyard on the west shore of Murter town. It is very much a do it yourself kind of yard but that suited our needs and our pocket. 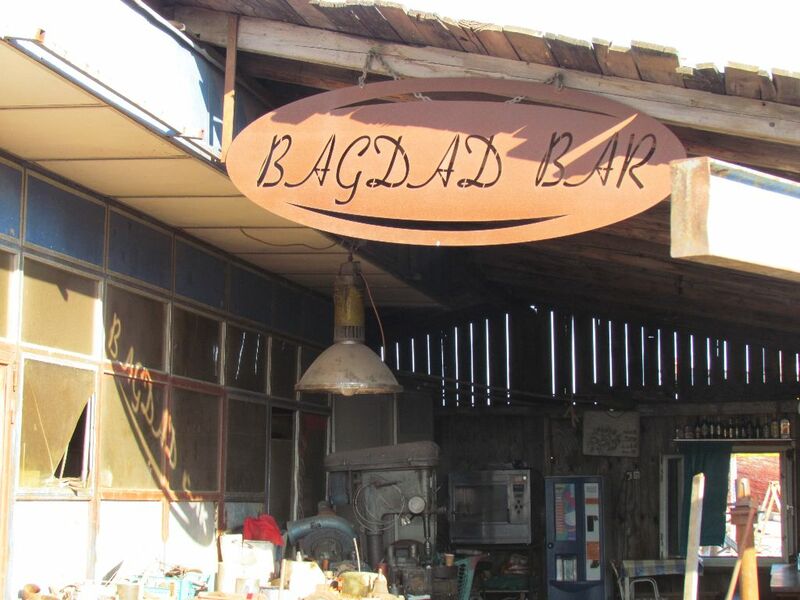 There is even a little bar for when the only thing that will solve a problem is a cold beer. A basic shower and toilets were available. A little English is spoken by some of the staff and along with the help from our neighbours we were able to find all the parts and expertise we needed. Magdd in Murter, up behind the post office. A general chandlers store, we bought paint supplies from here. Dodic on the way to Betina had an engineering workshop and a small chandlers where we bought new packing for the rudder stock. Hramina Marina has a chandlers shop too. 3Colori close to Betina Marina had very good supplies for painting and repairs including epoxy, primers and antifoul and all the other bits and bobs needed for painting. We found prices to be very reasonable; for example the Hempel paint was €35 cheaper per 2.5l tin than from online chandlers. Murter itself was a nice town to be stuck in for a while, with plenty of bars, cafes and restaurants as well as an outdoor veggie market and several supermarkets. Plus lots of ice cream shops for when we needed cooling down. Hi Nic. Wow that was a gripping blog ! I’ve been following the saga and its testament to your combined skills and fortitude to overcome the rigours of maintaining emerald in order to continue living your dreams. Well done to you both. Your description of the howling night, boats in distress and even disappearing was very good. The pics associated with the work made it easy to imagine being in your shoes ( face mask and gloves …lol ). Another emerging theme from your blogs over the last year has been the supportive community of fellow journeymen ( maybe that should now be journey people ) and chandlers you have enocountered that makes dealing with major issues more readily achievable. Best wishes for your onward journey. Thanks Phil. We have been so surprised and pleased by the random acts of kindness we’ve been given on our travels, we try to give back where we can as well to keep the kindness flowing 🙂 Last time we did the antifouling we had the opposite problem – freezing cold! We were glad of all the overalls then. We’ll try not to have to do work in the heat of summer again.